What is a Living Will or an Advance Health Care Directive? An advance health care directive — also known as a living will — lets your physician, family and friends know your health care preferences, including the types of special treatment you do or don’t want at the end of life. It will also include your desire for diagnostic testing, surgical procedures, cardiopulmonary resuscitation and organ donation. By considering your options early, you can ensure the quality of life that is important to you and avoid having your family guess what your wishes may be. It also alleviates the need for them to make critical medical care decisions for you under stress or in emotional turmoil. 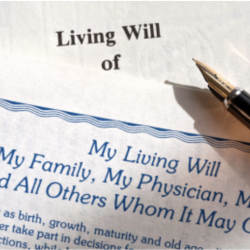 There are different requirements or forms by state; a complete list of forms and requirements by state can be found below as well as tips for completing your will or advanced healthcare directive. The National Hospice and Palliative Care Organization provide the forms found here. Once you have completed your advance directive, you need to talk to those who might be involved in implementing your health care decision-making. This includes family members, loved ones and your health care providers. You want them to understand how you feel about medical treatment at the end of life.